My love for baking started when I was about 10 years old. I would always hang around in the kitchen and watch my mom prepare baked goodies for us. I started making fudge, coconut ice, toffee apples and popcorn to sell to the school kids. If I tasted something new that my aunts or friends of my mom would make, I would always ask them for the recipe. My cake decorating started off as a hobby and was mostly self taught with guidance from a book or two. I attended a few basic courses and that is where my passion in designing and creating imaginative cakes started. My favorite past time is to read every recipe book and cake decorating book to inspire me for my next creation in sugar and chocolate art. I completed a diploma in Business Management and worked in the corporate world for 20 years. I decided to pursue my passion and enrolled at the Food and Beverage Institute where I completed an advanced diploma in Pastry Art. I was fortunate to study under well renowned chocolatier Nico Van Der Walt. I also had the privilege to attend workshops with the well renowned cake designers Alan Dunn, Debbie Brown and Paddy Clarke in London where I attended the Squires Kitchen Exhibition. 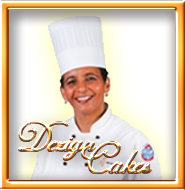 I am a member of the South African Chefs Association as well as the South African Cake Decorators Guild. I am passionate about food preparation and baking, and enjoy designing cakes. This kind of work is very laborious, but the joy and satisfaction is indescribable when your project is completed and this beautiful sugar creation is ready to go to your client.